Artist Trading Cards (ATC's) are miniature works of art created on 2 ½ x 3 ½ inch (64mm x 89 mm) pieces of card stock (same size as baseball cards). They are made with the intent of trading them with other people; they are not meant to be sold. 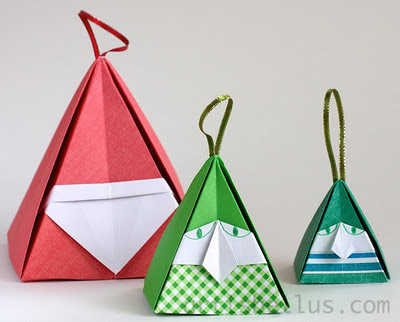 Origami ATC's, in particular, have an origami model glued to them, or they are letter folds whose final size is 2 ½ x 3 ½ inch (64mm x 89 mm). 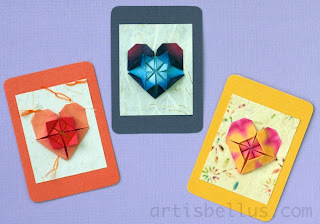 The hearts on the cards are my design, and were folded with 3" (75 mm) squares of patterned kami paper. You can find instructions to fold the hearts in here. There is also a video available in the Videos page. For a second there when I read the title I imagined cards for artists with stats or something. Like a card for say Robert Lang with various origami stats or something. Those would be pretty hilarious. Thanks. ATC's swaps have been around for a while. The cards are very fun to make. Regarding the origami artists cards, I don't know if they have stats, but Origami-shop (the link to the shop is on the right side of the blog) have some cards with origami artists caricatures. And yes, they are hilarious! 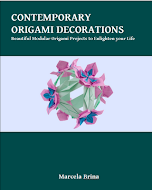 Look for "Other items - Origami Games" in their Catalog.